Photo courtesy - © 2010 Ed Massery Photograph. 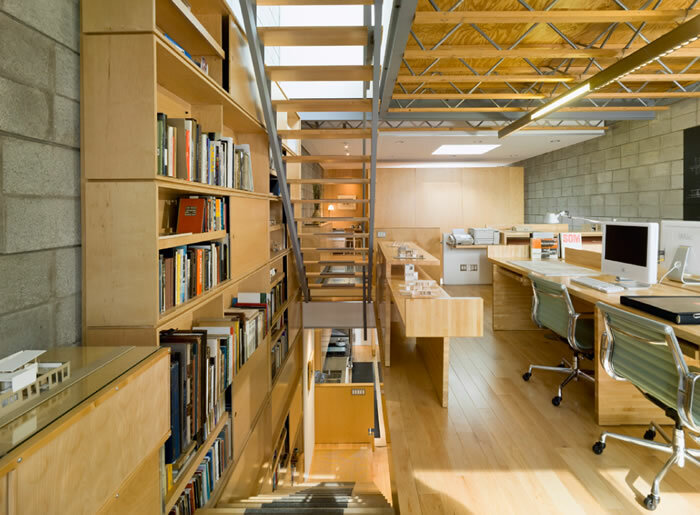 Nestled between nineteenth-century row houses in Pittsburgh, Pennsylvania’s historical South Side neighborhood, is the 2,400-square-foot, live-in/work-out-of habitat for Gerard D. Damiani and Debbie Battistone, of Studio d’ARC Architects. When they chose this 20-by-70 foot infill lot for their new home and studio, they wanted to show how a limited palette of materials can lead to a more spatial and unique architectural experience. It worked and the unique space serves as a physical case study for clients. 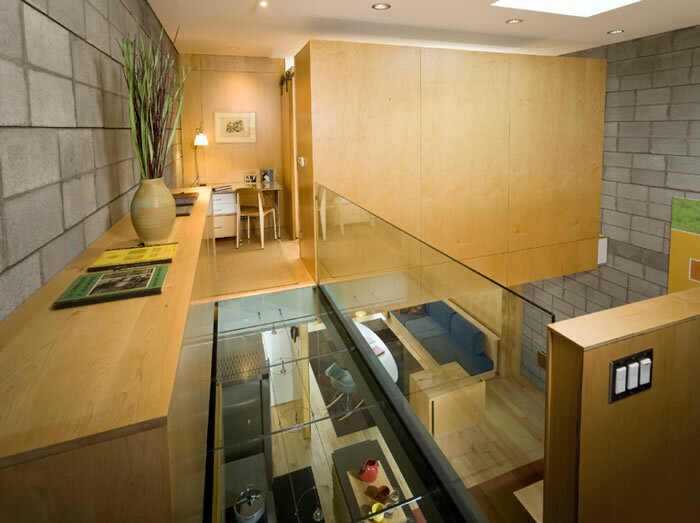 Outfitted predominately in soft maple to warm the exposed concrete block walls and enhance natural day lighting, the open floor plan incorporates kitchen, dining, and living areas on the first floor, while the second level features the couple’s bedroom and an open studio, separated by a bridge. “Clients are most impressed with how the daylight bounces off our maple floors and walls to form a warm glow,” said Battistone, who served as project manager. And for the homeowner/architect duo, emerging design trends were instrumental in the design of the multi-purpose space, which includes a rooftop terrace with dramatic views of Pittsburgh’s skyline. The finished product is a maple showcase. Interior window and door frames, as well as some cabinetry were constructed from solid maple. Paneling and cabinetry components were fabricated from maple veneer. And solid maple floors appear throughout. Mission accomplished! In addition to thoughtful material selection and regional sourcing (the duo even hired a local craftsman to build most of their new maple furnishings), Damiani and Battistone implemented some interesting energy-efficient strategies to address a required gap between bordering houses which could lead to potentially drastic energy loss. “We used foam swimming noodles, cut in half, and water-based log cabin chinking to fill and insulate the space,” noted Damiani. This innovative strategy, along with a high-efficiency HVAC system, programmable thermostat, and compact domestic hot-water system, lowered utility bills nearly 20 percent below the national average. 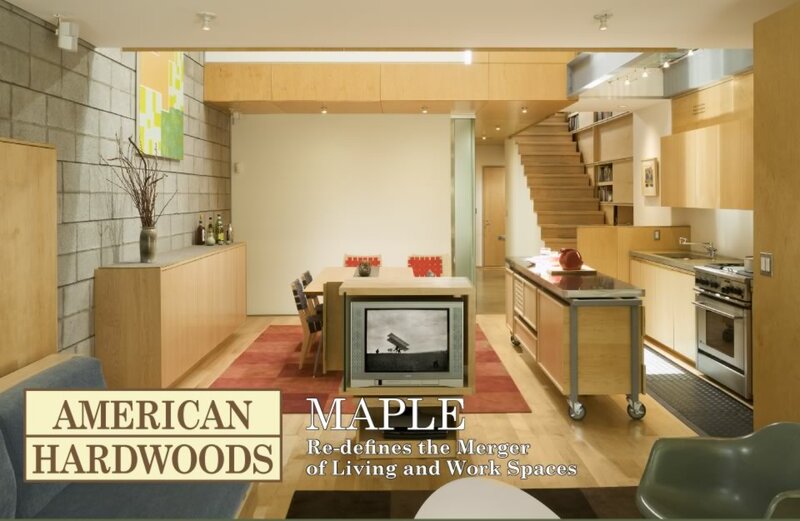 This extraordinary space—the product of creative and efficient design strategies—coupled with the beauty and warmth unique to its locally sourced soft maple, totally re-defines the merger of living and work environments.